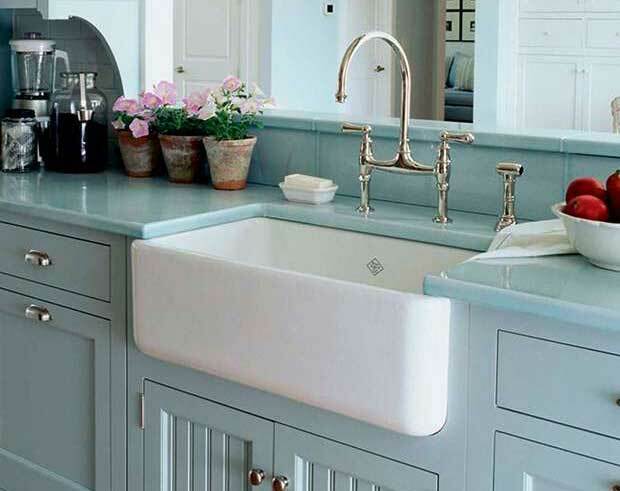 Ceramic sinks have a lot going for them and they add classic style to the kitchen, rather than just blending in. 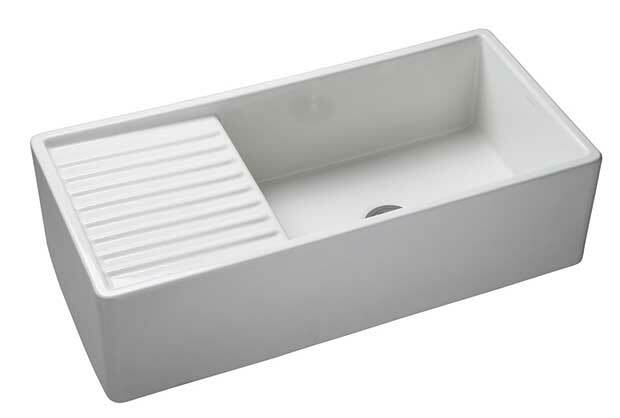 Made from raw materials such as clay, kaolin, quartz and feldspar, ceramic sinks are typically durable, easy to keep clean and reassuringly solid to look at too. But, as with every style of kitchen sink, there are a few considerations to take into account before deciding if a ceramic design is for you. 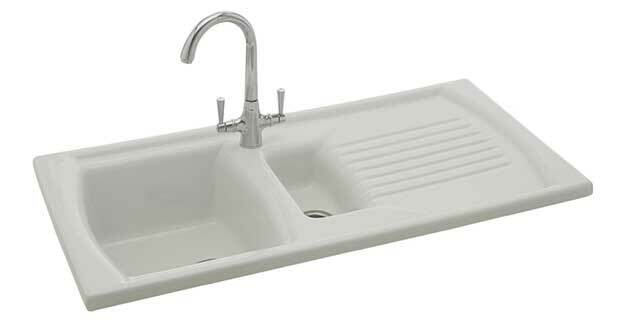 As with all things, there are good and bad points to consider when it comes to ceramic sinks. On the whole, ceramic is a material that works well for a sink. It won’t dent, like some stainless steel models. Its glazed surface is smooth and the way the sinks are fitted (more on that later) is seamless, so there are very few places for dirt and grime to hide, making them easy to clean. They are resistant to high temperatures, so it won’t matter if you plonk a hot pan on them. Although they are most often seen in gleaming white or milky creams, they also come in other colours such as black or stone. The negatives, however, include the fact that they can be rather unforgiving — that is to say, if you drop one of your plates or glasses in there, it is unlikely to remain in one piece. However, a removable sink mat can easily solve this problem. Next, although they won’t dent, ceramic sinks will chip and can crack — if you really try. 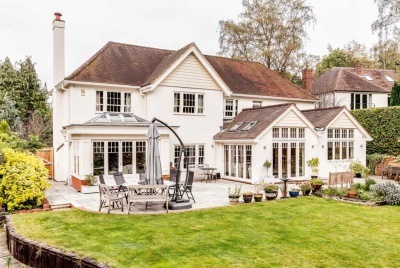 And, although glazed ceramic is pretty stain resistant, once the glaze is compromised (by a crack or chip) the area surrounding it can discolour. 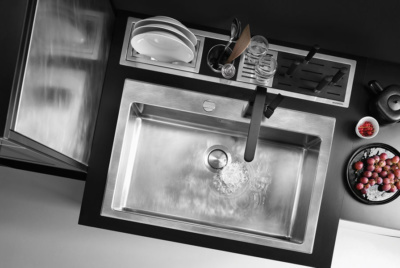 As with all kitchen sinks, ceramic designs come in a host of configurations and sizes. Whether you opt for a single, double or even triple bowl will depend on how you use your kitchen and also the worktop area you have available. In general, it’s recommended that you have 36 inches of worktop to one side of the sink and at least 18 inches on the other — so use this as a guide and take it from there. 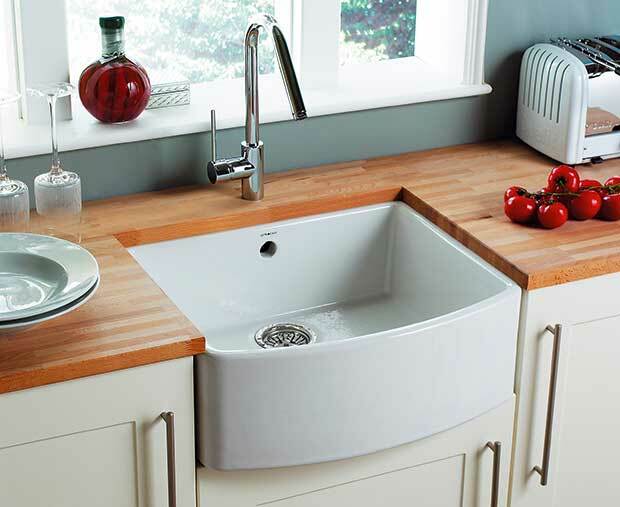 Worktop space aside, most people find it useful to have at least a one-and-a-half (1.5) bowl sink, enabling you to wash your hands or rinse off vegetables while the other bowl is in use. 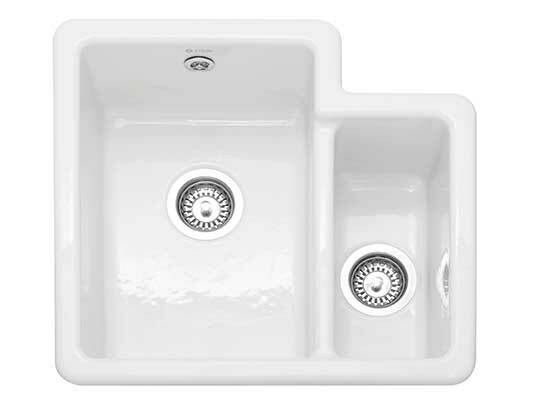 Ceramic sinks can be under-mounted, positioned under the worktop, or top-mounted (also called inset), whereby the rim of the sink rests on the surface. 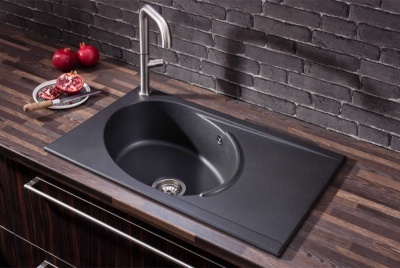 Although it depends on the style of sink you choose, inset ceramic sinks usually come as one piece, complete with a drainer. 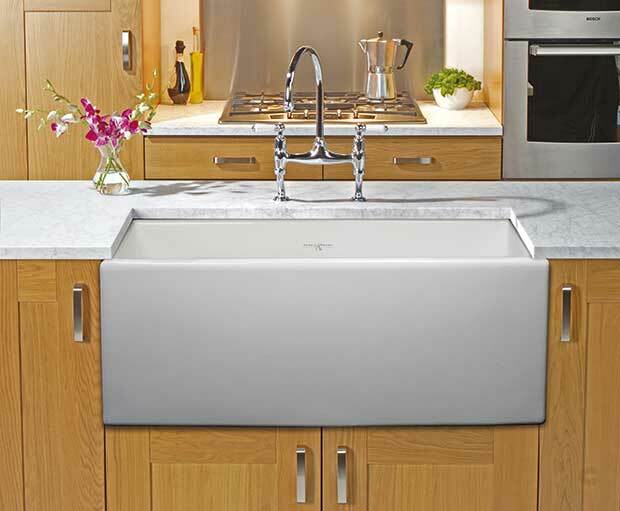 If you go for an under-mounted style (or a butler sink), you will need to have a separate drainer, or one that is moulded into the worktop. Some ceramic sinks come with pre-drilled tap holes, while others will require you to knock your own tap holes out (they often have indents to show you where to do it). 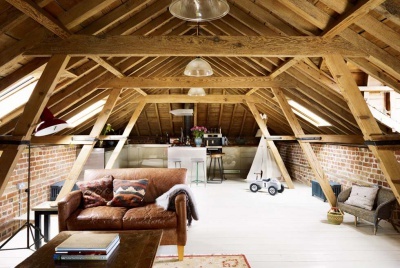 If you are worried about doing this, many companies will cut them for you for an extra cost. 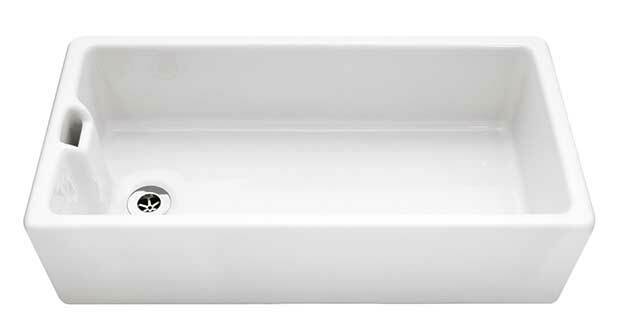 When most people think of ceramic sinks, butler sinks immediately spring to mind. A butler is a rectangular ceramic sink, set underneath the worktop. There are two kinds of butler — the London sink and the Belfast sink. Both are usually 600mm wide and 460mm front to back. 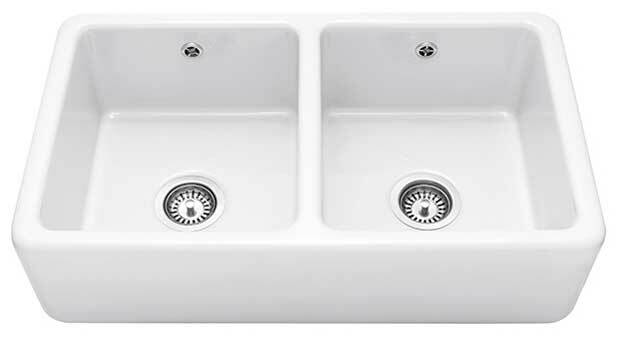 Butler sinks are also deeper than most standard sinks at 250mm, making them particularly useful in utility rooms for handwashing, etc. In the past, London sinks were shallower due to the fact that there was limited access to fresh water in London, meaning water conservation was important. The main difference these days is that Belfast sinks are made with a weir overflow. 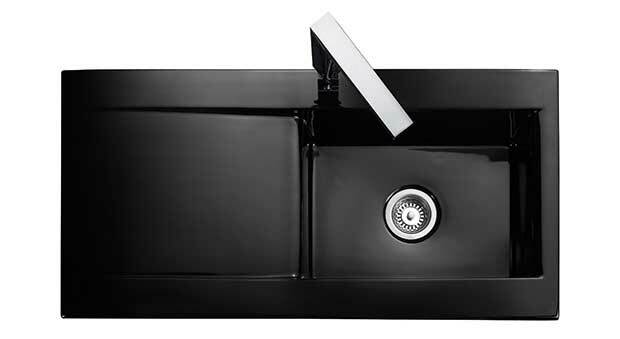 Although butler sinks traditionally comprised of just a single bowl, they’re now available in a range of configurations. They are almost always installed with the front of the sink on view.